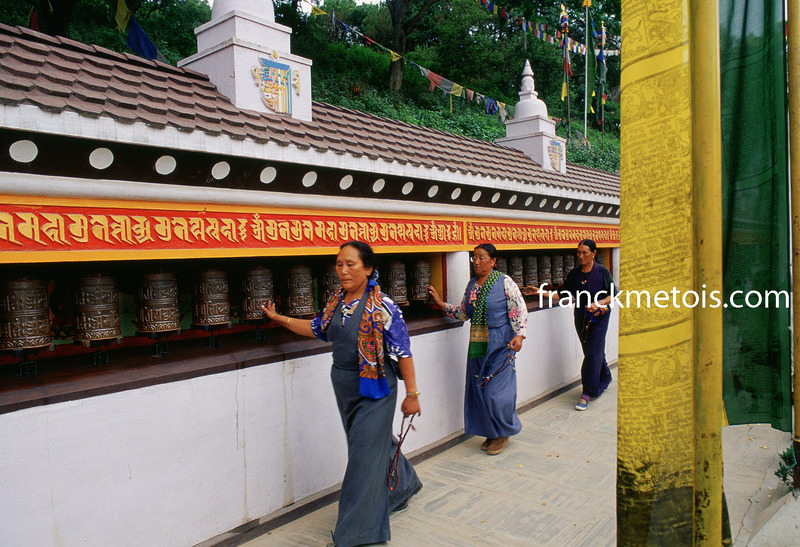 Tibetan women circumambulating around the stupa at Swayambhu. Kathmandu, Nepal. Today, 15 000 out of a total of 110 000 Tibetan exiles live in Nepal, predominantly in the valleys of Kathmandu and Pokhara. Many of these hard-working immigrants have now achieved success in the carpet and handicrafts businesses, to the point they can no longer be considered as an underprivileged group. Many are also playing an active role to establish Boudha ( one of the two main religious places for Tibetans in Nepal, the other one being Swayambhu) as a centre of buddhist study thus sustaining the Tibetan religion and culture. Because of Nepal’s reliance on chinese aid, the Tibetans are a source of discomfort for the government. China regards the exile communities as counter-revolutionary hotbeds, and exerts pressure on Nepal to suppress any political activities there. While the “Free Tibet” movement is much bigger in India, a Tibetan underground exists in Nepal, chiefly among the disaffected youth of the former refugee camps. But nobody discuss it openly, Tibetan leaders having been warned that any political remarks could mean prompt eviction. Recent political changes don’t seem to benefit the Tibetans. Powerful Nepalese Communist and Maoist parties have links with Beijing. So, they are keen to keep Tibetan nationalism in check. This entry was posted in Nepal, Tibet and tagged asia, asie, buddha, buddhism, buddhist, china, culture, exile, genocide, human rights, kathmandu, lamaism, nationalism, nepal, photographie, photography, religion, reportage, stupa, swayambhu, swayambhunath, tibet, tibetan, tradition, travel, voyage. Bookmark the permalink.